These never worn tennis shoes are by Coral Islands. 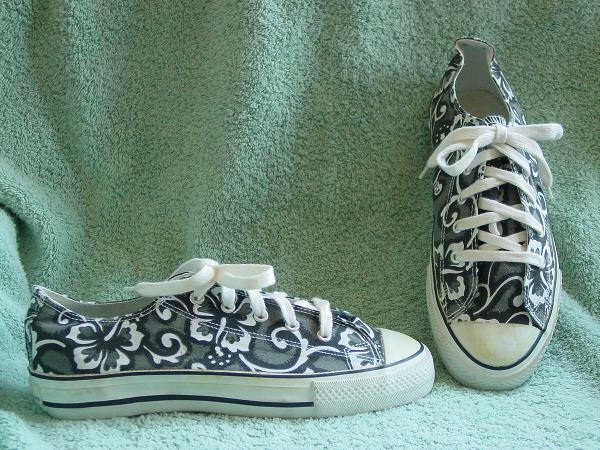 The fabric (canvas) is in gray, black, and white, and has a design pattern of tropical flowers. They have white laces and nonskid rubber soles. The white rubber along the sides of both shoes have some dark lines and the rubber on the toe, sides, and back areas has a slight yellowish cast. The tag says size 6 1/2. She bought 2 pairs in different sizes (wasn't sure which would fit the model). The other pair (larger) were worn in the photo shoot.